Pupils from Doncaster School for the Deaf have excelled since joining the Panathlon programme – culminating in their first ever gold medals in May at the English Institute of Sport. Having competed in numerous Panathlon competitions, it was the source of much joy when, at the South Yorkshire Primary Panathlon at the EIS in Sheffield, the school held off competition from seven opponents to finish as winners for the first time. It was a particularly proud moment when the children returned to school the next day adorning gold medals, especially as it was a pan-disability event (competing against pupils with a mixture of disabilities and SEN). Doncaster School for the Deaf has regularly hosted Panathlon multi-sport and boccia events over the last three years, with pupils from across Yorkshire, the East Midlands and Teesside arriving at their door to compete in deaf and pan-disability competitions. Jane Goodman, the school’s Deputy Head Teacher, comments: “Panathlon certainly champions the word inclusive. The atmosphere at their events is absolutely fantastic, positive and friendly. After their triumph in Sheffield, Doncaster School for the Deaf’s primary PE teacher Rebecah Taylor reflected: “Panathlon offers equal opportunities to all our children and an opportunity to compete against other schools. “Every child has achieved something and it has been valuable for them to experience the fast pace of the hearing world, but also learn to follow guidelines, have patience and work as part of a team. 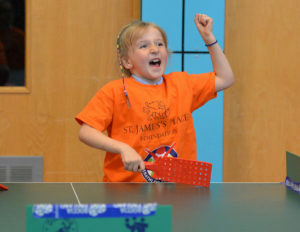 Panathlon has given them time to learn in a supportive and safe environment. The school is a national resource for the deaf and has deaf learners, primarily from across South Yorkshire but also via local authorities from across the UK. Pupils from the school are now looking forward to competing in the Panathlon Divisional Swimming Finals in June at Ponds Forge in Sheffield to battle for the title of northern champions.